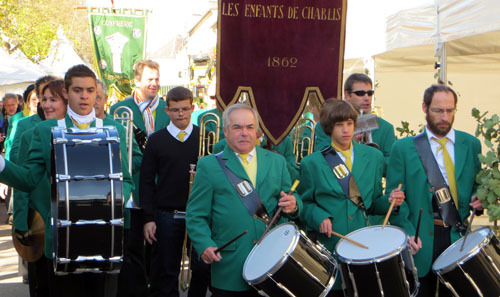 The Sunday morning Fete des Vin parade! PARIS – Sunday was really quite an exhilarating day to the end of a very brief trip to Chablis for the 64th Fete des Vins. A ceremonial and fun honor, an afternoon with an icon of Chablis winemaking, and more great white wine. The Les Piliers Chablisiens are a group of (mostly) elder Chablis statesmen who formed a brotherhood for those who bring honor to Chablis. Now, those are my words not there’s. They induct guests and those who contribute to Chablis into their organization with a fun and ceremonious ritual that was really an honor. Now they do induct quite a few but considering size and scope, there aren’t many of we Piliers out there. At an incredible Saturday night banquet about 20 members of the Chablis community and supporters were inducted into the brotherhood. 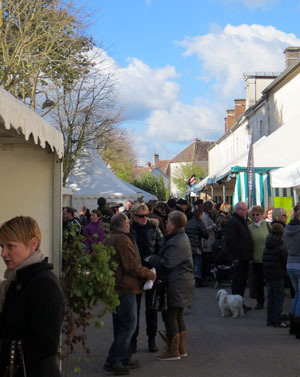 On Sunday morning following the Fete des Vin parade, a crowd gathered near the Chablis tourist office and one of the small village’s main gathering points. It’s hard to describe and maybe I can find a video somewhere. But after political speeches by local mayors and a regional governor, my three fellow journalists and I joined the brotherhood. We were brought to the stage where one of the members read a prepared short bio about our wine writing. Then we were given a rather large chalice of Chablis wine. The members break into a traditional French folk song and we had to chug the wine to be inducted. And, the group repeats the same “la, la, la’ until the last member of the group empty the vessel. I’m hoping to at least get a few photos. 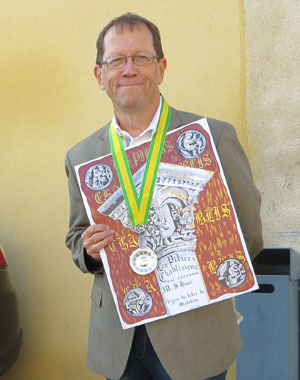 We were presented a certificate showing our membership and a lanyard with a small cup attached (see photo) that is a sign of honor seen throughout Chablis as a member of the Chablisiens. Having watched it Saturday night, I’ll just say it was great fun and way more cool than I anticipated going through the ceremony. I hit up quite a few of the booths Saturday and made it to just a few on Sunday. The Fete pales in comparison to the Bordeaux Fete le Vin I attended in July but they are totally different animals. The Bordeaux event had all the feel of an international tourist attraction while Chablis’ Fete des Vins felt more like a local celebration. I listed several wineries yesterday worth looking for at your better wineshops. I visited three Sunday and could only recommend one. Alain Geoffroy Chablis – This Chablis producer had very elegant wines but definitely in a lighter style than some. I found the wines very enjoyable. Some of the Chablis I tasted, including two other Sunday stops at the Fete’, went too far to the lighter side for my palate. It’s fair to say almost every wine region in the world has its iconic producers. 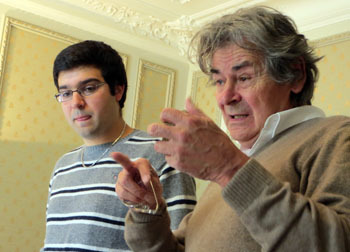 Few would argue or contest Bernard Billaud of Billaud-Simon is a Chablis household name. Bernard is everything a stereotype about a French winemaker should be. 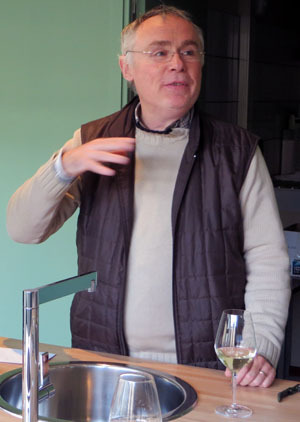 From his disheveled look, genuine smile and enthusiasm, to his almost angry definitions of what a Chablis wine should be – Billaud was extremely entertaining and educating. I lost count but we tasted around 10 wines. I will write more about that in a future post or column. But his wines have been widely distributed in the U.S. for more than 20 years and were clearly the best of the Chablis I tasted over this long weekend. But much more than acid, Chablis wines are about minerality and a sense of place, he insisted. It is really a cultural and unique wine experience to see these elder statesmen of such an iconic wine region as Chablis take to the pulpit and preach some fire and brimstone about their life’s work. I’ll write more soon about his specific wines. But if you want to enjoy some of the, arguably to an extent, world’s best white wines just try the Billaud-Simon label from any of the four appellations. Our final stop of the trip was at one of the world’s more successful cooperatives, Le Chabisienne. The cooperative has 300 members and makes a Petit Chablis, a few Chablis, and a Chablis Premier Cru from each of the different appellation regions, as well as the top-of-the-line Grand Cru. Herve’ Tucki, Chablisienne “Ambassador” poured a Petit, two Chablis, a Premier and Grand Cru. These cooperatives don’t work in a lot of country’s wine regions but this one has history on its side. Often in the wine world, cooperatives are considered second class wine or producers who can’t sell their grapes or juice any where else but not in Chablis. Le Chablisienne makes wines which are honored along side the region’s best known names like Billaud-Simon and others. Our day ended with a long taxi ride back to Paris. I’m staying at a very nice Hilton at de Gaulle airport. Two of the four members of my group, scheduled to fly directly to the east coast have already had their flights canceled because of the approaching hurricane.. My return trip is Paris to Detroit via Air France. As of this writing, my northern path seems clear and my flight is still on as of Sunday night. I often question myself before taking these press junkets, but again learned so much about a region that I would never have learned in any other way. I’m not a Chardonnay fan by nature.. But in Billaud’s words, if Chablis doesn’t have great minerality and sense of place, then you’re just making Chardonnay.